The need for a low-code platform rose when technologies like CRM, BPM, Case management, Project Management started not to be mutually exclusive. Integration of multiple systems like the above or unification of them, leads to the best low-code development tool conception where new business apps can be created with ease. Comidor helps you to build custom BPM Apps with no development skills needed. It starts with an idea and turns to a business app. Design, configure and optimize current business processes using marvelous functions. Why I need a Low-Code Platform? In modern business environments, applications are the tools needed to perform any type of work. From project management or people management to marketing or customer support activities, workers use apps to collaborate and perform work. Still, as new business problems arise, the need for quick and easy custom applications development was born. In some cases, custom development and long application development lifecycle is needed to build robust applications, but now, with Comidor low-code development platform, even business users can support and speed up a business problem resolution. with no development skills needed. Everyone, from small teams to large enterprises can empower their digital transformation with low-code configuration. Who can build applications with Low-Code? with no extensive IT skills who need to build apps for their teams customized to their needs. With app creation, they aim to solve usually a specific business problem. who are able to utilize a low-code platform to its fullest potential, can add the final touch of perfection and intelligence on the application, by re-using pre-built components and built-in features to any new business app needed. Comidor provides no-code and low-code functionality, depending on the extent of the application capabilities needed. Currently, with Comidor no-code capabilities, citizen developers can deploy, configure and deliver workflows and apps quickly – with low code, they give a twist of excellence and intelligence! Though, in our constant software updates, our aim is to transform low-code functionality to no-code and reduce to the minimum the technical knowledge needed. Comidor Low-Code Environment is one of the Comidor BPM platform aspects. Become intelligent using Comidor Low-Code Development platform to create process-based applications or simple apps on the fly! Comidor Low-Code development adapts smoothly to the Agile methodologies, with tools which foster enterprise collaboration, accountability and transparency. These low code tools help in the creation of an engaging user interface and business logic, which comply with your company’s activities and characteristics. Low-Code stands as the catalyst for Digital Transformation within an organization, as may model and digitize an application which visualizes a normal working procedure. Low Code Platform can address specific line of business (LOB) needs with a Business App creation, such as people management, finances, approvals, case management. Business Developers may design, configure and optimize current business processes using marvelous functions that come with Comidor. Empower employees with proper tools to work and run their business processes. Set process owners, assignees and start working upon specific process goals. Unify tasks, data and documents into one single view. All processes can run in parallel without distract non-assigned employees’ attention from their own work. With appropriate process dashboards employee can focus on each process performance and act upon them. Easily categorize your business processes based on their type and nature of work. Use ready off-the-shelf process-based applications from Comidor Process Library or create your own business process templates. 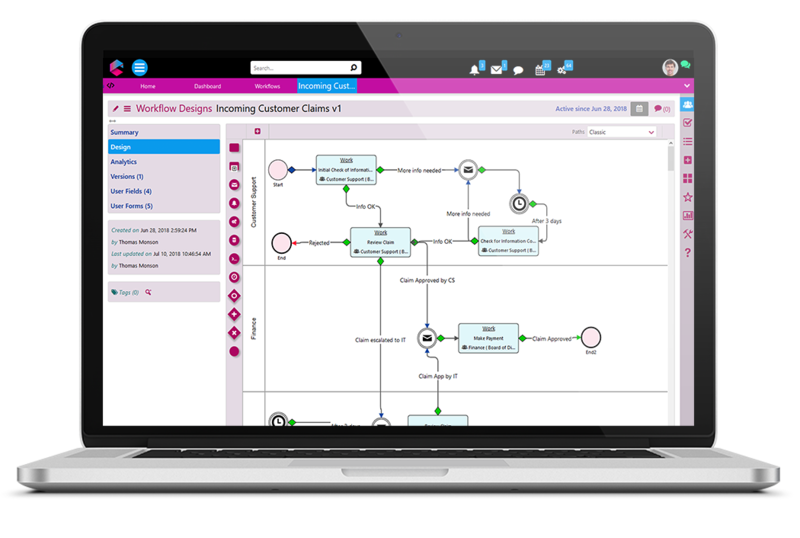 Use intuitive Workflow modeler to automate your tasks and processes. Pre-defined elements such as tasks, sub-processes, notifications or emails events are there, ready-to be used from everyday business developer users. 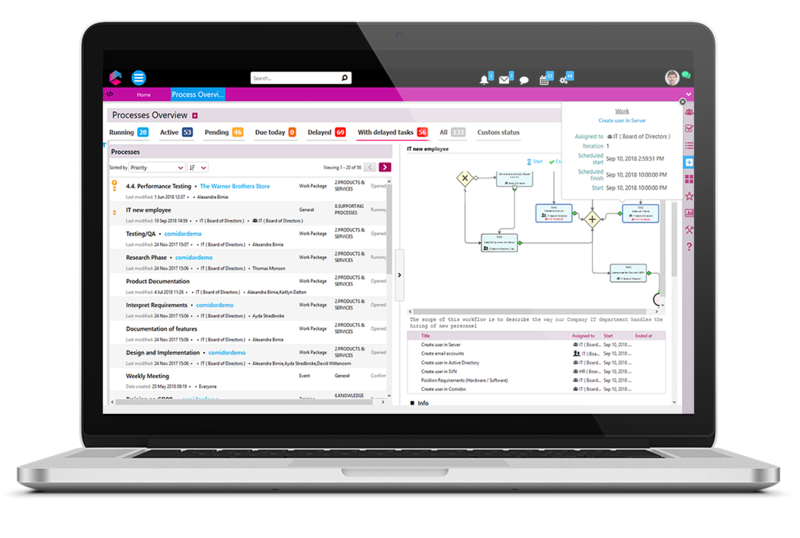 Automate all everyday critical business processes using process scheduling and templates. 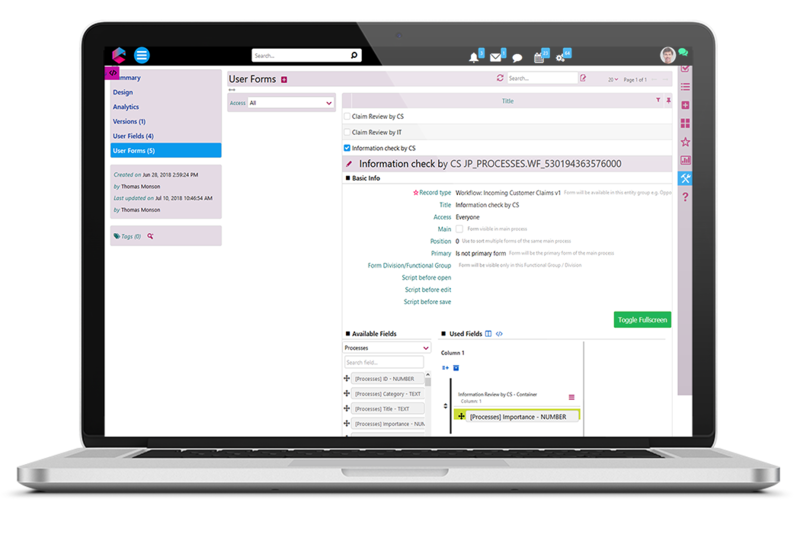 Customize process instance view based on the level of user, their responsibilities and involvement on process goals. Enhance process-based applications with custom forms and fields, ready-to-use components and custom view environment per roles and user-level. Add metrics to monitor your business processes using custom-dashboards creation and online Process monitoring ready-to-use Analytics. Be aware of process bottlenecks on time, check average time spent on each step, prioritize processes, track user load and optimize resource allocation. 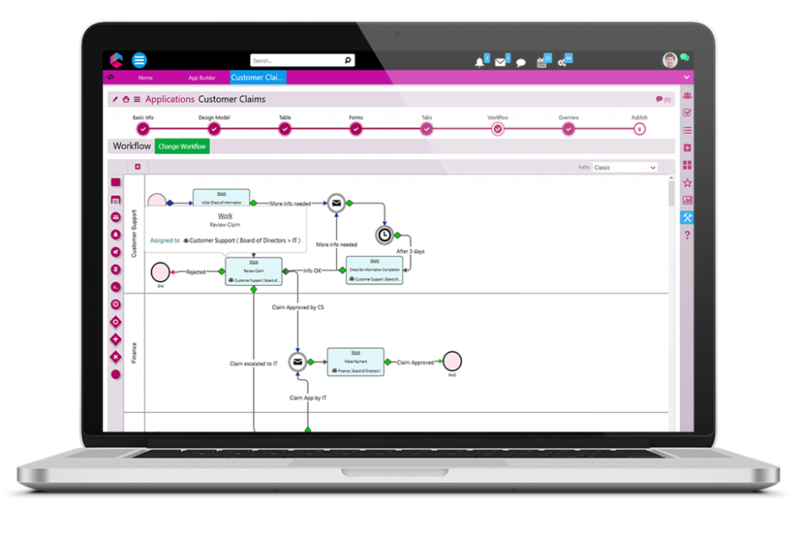 Design the Workflow using drag-n-drop process modelling interface with all elements you need (BPMN 2.0). Use decision engine for complex logic modeling and escalation events for specific cases. Organizational structure and roles of users can be used to assure only certain people will collaborate on a process execution, making people accountable on performing work on time. Template building can limit errors to 0 having simple users not to search what to put on each information cell. Unlimited records, copying and versioning of Workflows are available. Processes integrated in a collaborative platform are both available via Desktop and Mobile. Customize apps to your needs with user forms and custom user fields. Create these visual forms using models instead of code writing. Drag-n-drop interface makes life of business users easier. Ability to create global of workflow-specific fields for the forms, which can be re-used again and again. Database fields which Comidor offers already complete the available fields list. Keep processes secure by having different blocks of info available to each team, departments of even subsidiary. Add properties to each field either using pre-defined properties selection or scripting language. Intuitive environment which forces you not missing a step. On-the-fly configuration of Data Model with ability to import custom fields. Modelling of forms’ columns with components positioning. Quick and easy re-ordering of blocks of fields. 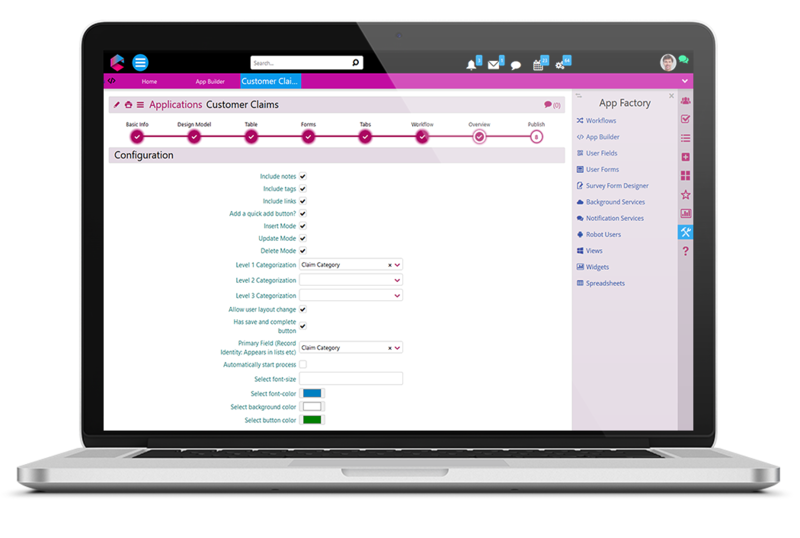 Endow Business Apps with workflow stages which obey on complex conditions. RESTful/SOAP web services quick configuration to add-on your Business App. 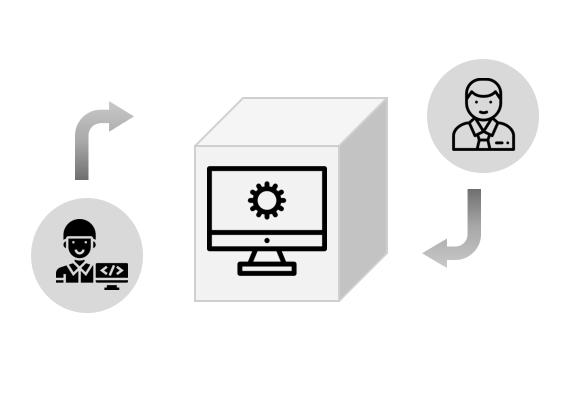 APIs configuration is an option in case of application extension need to other applications. Track App performance within teams, analyze results and identify need for improvement. Corporate Performance improvement in due time with lower costs is achieved. Low-Code complies with Agile Methodologies – your company is ready to adapt to any change smoothly. Visual Designer and drag-n-drop interfaces simplifies application development. Employees’ productivity increases through exceptional user experience and work control and monitoring. Unlimited capabilities provided to experiment on the business application creation. Any idea can be transformed to a simple business app, which can be optimized to the fullest based on the level of business developer user. Department and cross-department Apps and Workflows endorse Enterprise Collaboration which improve team’s productivity. Empower citizen developers to create solution which solve a business problem. Department and cross-department Apps and Workflows endorse Enterprise Collaboration which improves team’s productivity. Easy personalization of User-Experience within different level of users, using user roles, permissions, templates.